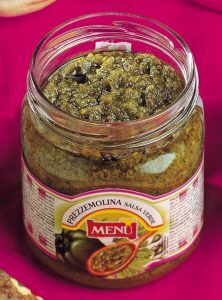 A sauce made from walnuts, Parmesan cheese, olive oil, and sunflower oil. After mixing the sauce, pour it directly on the hot pasta or the pasta and sauce may be sautéed in a frying pan combined with Menù’s Cream of Five Cheeses or cream. Ideal for pasta dishes, new potatoes, sandwiches, and canapés. It can be served with various types of cheese and vegetables. 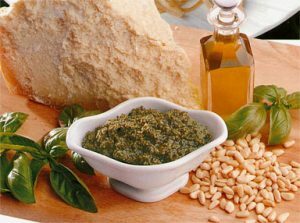 “Salsa verde” prepared according to a traditional recipe with parsley, green peppers, capers, anchovies, and sunflower oil. 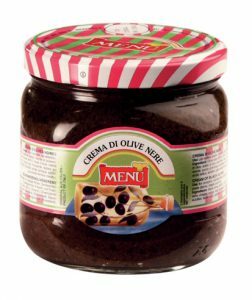 This cream of exquisite black olives blended with olive oil, salt, and a dash of lemon juice and vinegar is so delicious that it has been nicknamed Italian caviar. For canapés, sandwiches, and very original pasta dishes. It can be mixed with Pomodorina Tomato Sauce or cream to make a sauce for main dishes. 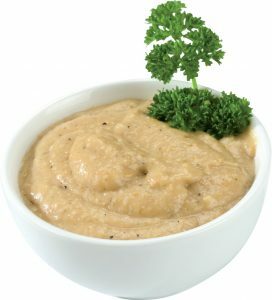 A sort of mustard made with pieces of orange pulp and onions. It has a hot taste with a certain sweet and sour tang. for side dishes with stewed meat and poultry. 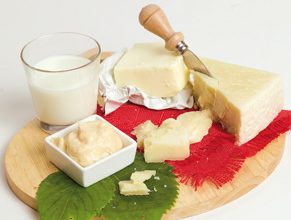 Ideal with seasoned chesses (grana, montasio, pecorino), and fresh cheeses (ricotta and mascarpone). ti7Thick dark red/caramel colour sauce, with an aromatic flavour, containing large chunks of strawberries. 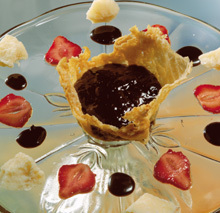 A sweet and sour flavour with the typical taste of strawberries and balsamic vinegar. 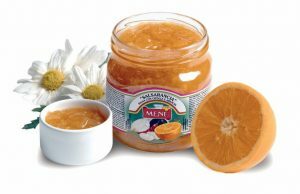 ideal with sweets, ice cream, pancakes, cream and cooked cream as well as on meat, stewed meat and poultry. It’s also fine with seasoned cheeses (grana, montasio, pecorino) and fresh cheeses (ricotta and mascarpone). Soft cream with sheep’s cheese processed in aseptic conditions. Ideal as a sauce for bucatini, gnocchi, rice and pasta in general. Excellent use on bread and pizzas. Choice sun-dried tomatoes from the South of Italy, that have kept their natural bright red color and their exceptionally soft texture. They are packed in olive oil and sunflower oil. Excellent for hors d’oeuvres, sandwiches, pasta dishes, pizzas, and with cocktails. Porcini mushrooms, finely chopped and blended with the essence of truffle.